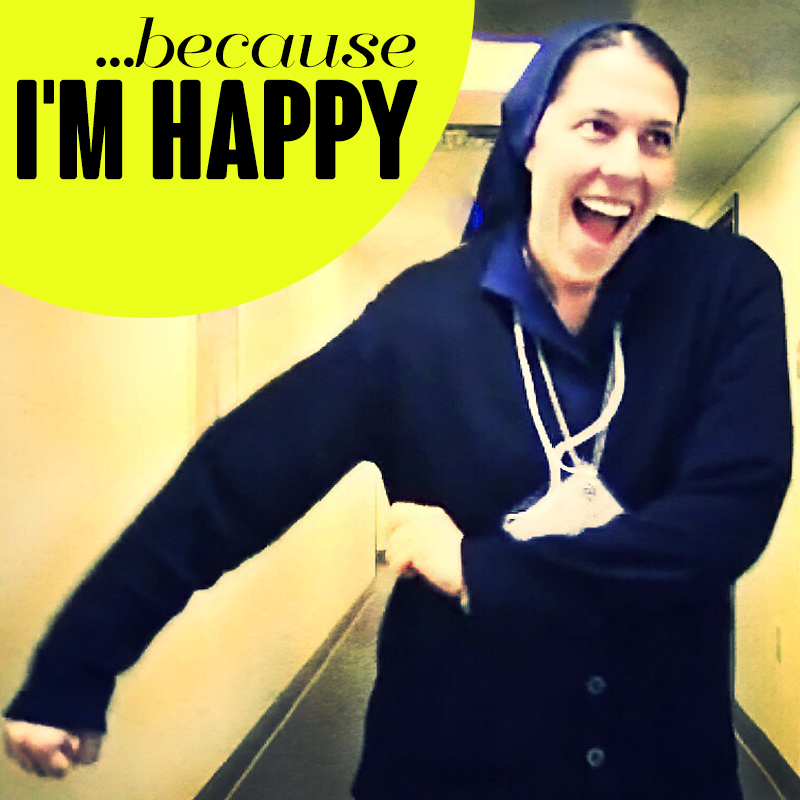 by Sister Liz Sjoberg, D.C.
One of my favorite quotes about joy comes from St. Theresa of Avila: "A sad nun is a bad nun." Something that initially attracted me to Catholic Sisters in general and the Daughters of Charity in particular was that I met many Sisters who knew how to laugh, didn't take themselves so seriously, AND were committed to an intense life of prayer and service. Perhaps I had previously assumed Sisters spent hours in the chapel, spoke only of holy things and never indulged in frivolity. Boy, was I wrong! Do we pray? Absolutely. Do we discuss important issues that affect the people we serve? No doubt! But we also get super-psyched about Suor Christina winning the Italian "The Voice" competition. In working on the "Happy" video project, I have had a chance to see joy--which, by the way, is a fruit of the Holy Spirit!--clearly displayed. We had Daughters of Charity from all over the U.S. submitting video footage and dancing like crazy! But maybe the better title of the video should be "The Joy Video." Because we all know happiness is a feeling that comes and goes. What I see in this video is a group of Sisters who love life and don't mind looking a little silly for the purpose of reaching out to others. What I see is the fruit of women who love Jesus, love community and live intentionally. My hope is this video serves as an invitation to something deeper: Have a good laugh, but then discover where this joy comes from. And after that, take a moment and pass it along to others! This video is adorable :) DOCs rock!! Thanks, Jessica! We're glad you liked it. God bless!